Electroencephalography (EEG) and electromyography (EMG) are neurophysiology devices that are designed to help physicians assess the functions of the central and peripheral nervous system such as the muscular system. These analytical tools are used for understanding the progression of diseases and disorders such as epilepsy, sleep disorders, neurological critical care, and cognitive alterations. Therefore, the rising pool of geriatric population that is prone to these conditions is expected to drive the growth of the global EEG-EMG equipment market in the coming years. Owing to these reasons, the global market is expected to be worth US$2.4 bn by the end of 2024 from US$1.3 bn in 2015. Between the forecast period of 2016 and 2024, the global market is estimated to expand at a CAGR of 7.4%. The market is also likely to be driven by the high prevalence of brain disorders among elderly population such as Alzheimer’s disease and Parkinson’s disease. Furthermore, remarkable innovations in the technologies used in the overall market for developing devices to treat sleep disorders are expected to accelerate the growth of the global EEG-EMG equipment market. The increasing number of pediatric neurological disorder cases are also expected to augment the demand for EEG-EMG equipment in the near future. The commonly seen pediatric neurological disorders are brain tumors, spinal degenerative diseases, neuropathies, movement disorders, and epilepsy. On the basis of product, the global EEG-EMG equipment market is divided into electroencephalography and electromyography. Of these, the EEG segment led the pack, accounting for nearly 61.6% share in the global market in 2015. This segment is expected to continue its dominance throughout the forecast period as they are used in neurodiagnostic centers, hospitals, and research institutes in order to gain accurate and effective diagnostic results. The report also indicates that the EMG segment is also anticipated to grow at a phenomenal pace during the forecast period as the cases of spinal cord or neural diseases among geriatric population continue to be on the rise. The innovation in technologies and software to enhance the quality of EEG equipment required for treating Alzheimer’s disease and Parkinson’s disease are also projected to drive the global market. In terms of geography, the global EEG-EMG equipment market is segmented into North America, Europe, Asia Pacific, Latin America, and the Middle East and Africa. North America held a leading position in the global EEG-EMG equipment market in 2015, accounting for a share of 35.1% in the overall market. The region is expected to continue its dominance in the coming few years due to the high prevalence of neural diseases and presence of healthcare awareness program for the aging population. Additionally, technological developments and growing demand for neurophysiology devices from both physicians and researchers are also anticipated to impact the regional market in a positive way. The key players operating in the global EEG-EMG equipment market are Nihon Kohden Corporation, Cadwell Industries, Inc., Compumedics Limited, Medtronic, Natus Medical Incorporated, Electrical Geodesics Inc., Masimo Corporation, Zynex Inc., Allengers Medical Systems Limited and others. As of 2016, Nihon Kohden Corporation held a dominant share in the global EEG-EMG equipment market. This report on the EEG-EMG Equipments market analyzes the current and future scenario of the global market. Large number of Parkinson’s disease, epilepsy incidences and sleep disorder rate among patients is increasing the usage of EEG-EMG Equipments. Less pain and high definition imaging technology are the major drivers of the global EEG-EMG Equipments market. 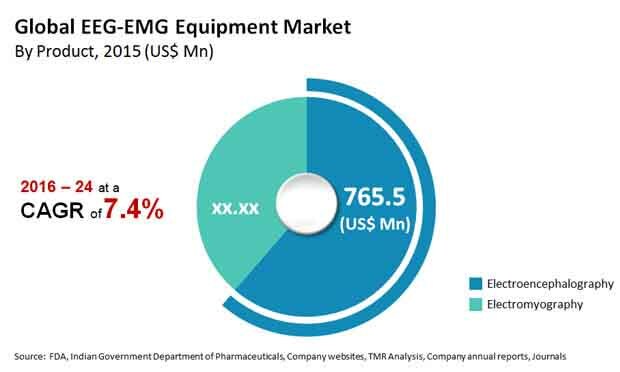 The EEG-EMG Equipment market report comprises an elaborate executive summary, which includes a market snapshot that provides information about various segments of the market. It also provides information and data analysis of the global market with respect to the segments based on product, modality, end user and geography. A detailed qualitative analysis of drivers and restraints of the market and opportunities has been provided in the market overview section. In addition, the section comprises Porter’s Five Forces Analysis to understand the competitive landscape in the market. This section of the report also provides market attractiveness analysis, by geography and market share analysis by key players, thus presenting a thorough analysis of the overall competitive scenario in the global EEG-EMG Equipments market. Based on product, the market has been segmented into Electroencephalography and Electromyography. The product market segments have been analyzed based on available approved products, cost-effectiveness, and preference for technologies by neurologist and patients. The market size and forecast for each of these segments have been provided for the period from 2014 to 2024, along with their respective CAGRs for the forecast period from 2016 to 2024, considering 2015 as the base year. Based on End-user, the EEG-EMG Equipments market has been segmented into five major categories: hospitals, diagnostic centers, research institutes, homecare settings and ambulatory surgical centers. The EEG-EMG Equipments are segmented into portable and standalone devices. The market segments have been extensively analyzed based on prevalence of the diseases, available treatment, and geographical coverage. The market size and forecast in terms of US$ Mn for each segment have been provided for the period from 2014 to 2024. The report also provides the compound annual growth rate (CAGR %) for each market segment for the forecast period from 2016 to 2024, considering 2015 as the base year. Geographically, the global EEG-EMG Equipments market has been categorized into five major regions and the key countries in the respective region: North America (the U.S., Canada), Europe (the U.K., Germany, Russia, France, Spain, Italy, and Rest of Europe), Asia Pacific (Japan, India, China, Australia & New Zealand and Rest of Asia Pacific), Latin America (Brazil, Mexico, and Rest of Latin America) and Middle East & Africa (South Africa, GCC countries and Rest of Middle East & Africa). The market size and forecast for each of these regions and the mentioned countries have been provided for the period from 2014 to 2024, along with their respective CAGRs for the forecast period from 2016 to 2024, considering 2015 as the base year. The research study also covers the competitive scenario in these regions. The report also profiles major players in the global EEG-EMG Equipments market based on various attributes such as company overview, financial overview, product portfolio, business strategies, and recent developments. Major players profiled in this report include Compumedics Limited, Medtronic, Natus Medical Incorporated, Cadwell Industries, Inc., Electrical Geodesics Inc., Masimo Corporation, Nihon Kohden Corporation, Zynex Inc., Allengers Medical Systems Limited and others.